George Clooney is rapidly becoming to this generation of Hollywood filmmakers and actors what Robert Redford was to the last - a determinedly liberal voice with deep reservoirs of scepticism regarding the nature of American politics and culture. After the disappointing screwball homage Leatherheads (2008), Clooney is on much surer ground taking on the dark undercurrents lurking beneath the flashy veneer of the American political system. 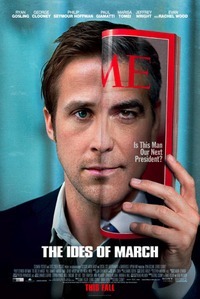 The Ides of March focuses on a young, idealistic junior campaign manager Stephen Meyers (Ryan Gosling) working to secure the Democratic Party’s presidential nomination for his candidate, Governor Mike Morris (George Clooney). Meyers idolises Morris, whom he believes to be the only candidate who can successfully restore America as a respected leader in international affairs. The Ides of March begins with Morris rapidly closing in on the nomination, and a win in the upcoming Ohio primary contest would all but secure it. However, Meyers’ youthful naïveté gets the better of him, and he places the campaign in jeopardy by agreeing to meet with his opposite number, Tom Duffy (Paul Giamatti), campaign manager for Morris’s Democratic rival, Ted Pullman (Michael Mantell). As one might expect, things begin to unravel rapidly. The Ides of March should have been the defining political thriller of our time. That it isn’t is a crying shame, given the context in which it was made. The early 21st century has repeatedly cast serious doubt over the ability of the United States to be a leader on the world stage. The failure of the responses to 9/11 and the fallout from the financial crisis have revealed American power to be on the wane. American politics is a circus, and the recent bickering over the raising of America’s debt ceiling showed that the system is currently incapable of addressing global challenges. The Ides of March goes some of the way to demonstrating this unease, but pulls its punches just when it should be going for the knockout. If anything, it feels rather dated, as though it hasn’t realised that cynicism about American politics has long been all-pervasive - public faith in the institution having been continually undermined by the Vietnam War, the Watergate scandal, Iran-Contra, Monica Lewinsky, the installation of George W. Bush, the manufacturing of a war in Iraq, the scandal of Abu Ghraib, and so on. Now, I’m not normally one to champion this kind of thing, but The Ides of March could have stood to be longer. It has no room to breathe at 100 minutes, and the two narrative events around which the film’s dramatic punch pivot (the previously idealised Morris’ fall from grace and Meyers’ realisation of the imperfect nature of the political system) are not established with anything like the kind of conviction necessary to ensure a satisfying resolution. We are supposed to believe that Morris is The Next Big Thing, possessing similar messianic qualities to Obama (2008 vintage, not 2011 disappointment). Indeed, Morris’s similarities to America’s actual president are demonstrated by Clooney’s neat referencing of the retro Obama campaign posters throughout. However, these characteristics do not translate into the film’s construction of Morris himself. Clooney trades solely on his obvious star charisma to portray Morris and, while he looks the part, and there are a few nice speeches about energy independence and peacemaking, there is a distinct lack of gravitas in his performance; he is simply not compelling enough for the subsequent downfall to carry any kind of heft. Concomitantly, Meyers’ wide-eyed innocence and later realisation are not particularly convincing. As a result, The Ides of March winds up with nothing new to say about American politics: it is simply an ugly system, and no matter how good you try to be, its flaws force you to make moral compromises in order to succeed. We have been here before. No American president leaves office with an unblemished record. Politicians are by turns corrupt and corrupting, and the sub-genre of Hollywood film dealing in this theme has a long and rich history. The disappointment with, and suspicion of, politics and politicians has been chronicled in The Manchurian Candidate (1962 & 2004), Executive Action (1973), The Parallax View (1974), All the President’s Men (1976), JFK (1991), Bob Roberts (1992), Absolute Power (1997) and Primary Colors (1998) are just a few amongst many, many others. As in U.S. politics, so in the UK has the MPs expenses scandal now forever tarnished the reputations of politicians to the extent that we would all be forgiven for assuming that they have their hands in the till until proven otherwise. Perhaps this is why The Ides of March does not live up to expectations. We’re simply too jaded to be surprised by its rehearsal of yet another politician’s (fictional or otherwise) fall from grace. This review was published on November 21, 2011.